Adriana Sblendorio has been playing soccer since she was 4 years old. She grew up in the Bay Area in Livermore, CA where she played competitive club soccer for the Mustang Soccer Club. She loves to play attacking or holding center mid and continues to play for the University of San Francisco women’s club team. She’s studying psychology with a minor in neuroscience. “I love seeing the girls accomplish something on the field that they have been trying to achieve and then see them get so excited to share with me their success!” She just completed all the US Soccer Federation Grassroots coaching license requirements and is excited to share her knowledge with her teams. Adriana is the head coach of our 1st grade micro-soccer team and the assistant coach to our SF Sol Courage 05 girls competitive team. 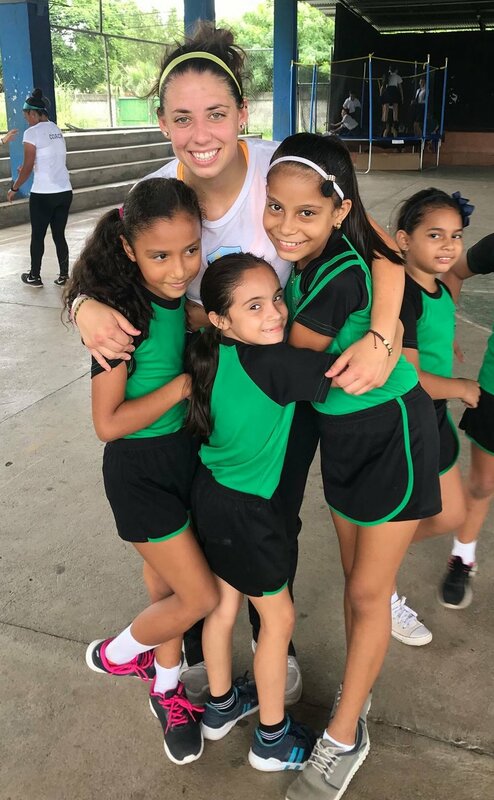 This past summer Adriana came with us to Costa Rica on our summer service trip to share her love for the game with girls less fortunate in the rural communities of Puntarenas Costa Rica. Originally we were planning to return to Nicaragua, our usual destination for our summer international service trip. But due to the political unrest that began just two months before our departure we had to think fast and change course, slightly south, to Costa Rica. There we spent 5 days in a small town on the coast called Puntarenas. We coordinated logistics with a partner organization called Woza, they conduct soccer service trips in Costa Rica, Peru, Malawi every summer for high school aged groups and teams. Upon arrival we quickly jumped into the rampant soccer culture and played a night pick up game on the outdoor basketball court. The next day we began our service at the Roble elementary school nearby. There we worked with about 40 children, boys and girls ages 7-14. These children we worked with are orphans from local families that were unable to provide for them. They live in an orphanage nearby and attend this school everyday. Our girls- junior coaches ages 12-14, jumped in emphatically to start playing with the kids and learning about their lives. The two groups attached to each other seamlessly. We played soccer for a few hours with them and then swam in the beach, played pick up beach soccer with some locals and then played indoor soccer with some of the older very skilled boys in the community. Using our Spanish to communicate proved challenging but also humorous. Their English was pretty good so we were able to get by. The next few days were similar with the exception of the second day. We noticed the girls were not playing that much and saw the reason was that the boys were not passing to them and often taking the ball from them even when they were on the same team. So we separated the boys from the girls and found the girls to be very interested, excited, and wanting to play more! Some of the girls had exceptional skills and athleticism. The girls were happy and that made us happy in return, to make them smile and let them know we support them. On our last day we were able to visit the soccer academy run by a local professional soccer player named Roberto. He had a group of about 45 boys and 2 girls participating in the academy session that was run by another professional player at the local soccer stadium. The session was impressively very collegiate in its drills and style of play. After four days of coaching and playing endless amounts of soccer we had a day off to swing in the beautiful Costa Rica lush forest for some zip lining. We left Costa Rica wishing we could spend another week there- feeling grateful, accomplished, closer, and our hearts full. We plan to return and also remain connected with the local community partners, Roberto and Karol, to start a girls summer soccer program just like our Nicaragua program to get more girls playing and to provide the resources they need to do so. If you want to help by either donating soccer cleats & clothes or by donating towards the $3,000 summer program cost here we know the girls will be extremely grateful! Check in here for the updates on registration dates, the latest games, our community service and more. Follow up on social media. National Girls and Women in Sports Day 2019! Community Party and Fundraiser at Airbnb HQ!